Russian President endorses Egyptian army chief's presidential bid, sparking outrage from the United States. Russian President Vladimir Putin on Thursday endorsed Egyptian army chief Abdel Fattah al-Sisi's undeclared bid to head his country, sparking outrage from the United States. AFP reports that Putin’s announcement was made as the two leaders negotiated a massive Moscow weapons deal. Sisi came to Moscow with Egyptian Foreign Minister Nabil Fahmy for talks aimed at securing Russian assistance - stagnant since the late Soviet era - that could replace subsiding support from Cairo's more recent ally Washington. However, it was recently reported that Congress is prepared to allow U.S. President Barack Obama to restore $1.5 billion in aid to Egypt. 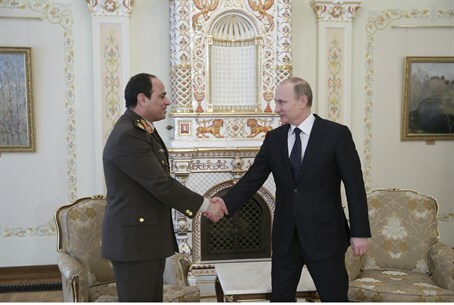 Putin told Sisi that he fully backed Egypt's new constitution and crucially made no mention of Cairo's crackdown on protests or the army-backed overthrow in July of Morsi. "I know that you, mister defense minister, have decided to run for president of Egypt," Putin told Sisi in televised remarks quoted by AFP. "I wish you luck both from myself personally and from the Russian people." The 59-year-old Egyptian field marshal has not officially declared his presidential ambitions but is overwhelmingly expected to run in elections likely to be held before the end of April. A Kuwaiti newspaper had quoted Sisi as saying last week that he felt obliged "to meet the demands of the Egyptian people" and run for head of state. The army later denied the report. Sisi and Fahmy had earlier on Thursday met their Russian counterparts to negotiate a $2-billion arms deal the two sides initially discussed in Cairo in November, a month after Washington suspended the assistance to the Egyptian army over Morsi's ouster. "Our visit offers a new start to the development of military and technological cooperation between Egypt and Russia," Sisi told Russian Foreign Minister Sergei Lavrov and Defense Minister Sergei Shoigu. "We hope to speed up this cooperation," he added. Top officials revealed no details of Thursday's military discussions while signaling that both sides were interested in the speedy conclusion of a deal. "It was decided to accelerate preparations on an intergovernmental agreement on military and technological cooperation," a joint statement released by the Russian foreign ministry after the talks said. Responding to Putin’s backing of Sisi, the State Department scolded Putin, saying it was up to the Egyptian people to decide who will be their leader. "Of course we don't endorse a candidate and don't think it's, quite frankly, up to the United States or to Mr. Putin to decide who should govern Egypt," said State Department deputy spokeswoman Marie Harf, according to AFP. "It's up to the Egyptian people to decide," she added. "It's not up (to) us to endorse a candidate, and really not up to anyone else outside of Egypt to either," Harf told reporters.